The third day of Ranji Trophy 2018/19 saw Uttar Pradesh defeat Tripura by an innings and 384 runs to consolidate their position in Elite Group C.
In Elite Group B, Delhi defeated Madhya Pradesh by 9 wickets to register their first win of the season. In other matches, Karnataka needs 9 wickets to win the match against Railways. The match between Assam and Goa is heading towards an exciting finish with Goa needing 52 runs to win with 4 wickets in hand. Mumbai have taken the first innings lead against Saurashtra. Starting the third day at 213 for 5, Saurashtra were bowled out for 348. In their second innings, Mumbai made quick progress and ended the day at 175 for 5. Mumbai 394 in 107 overs (Bista 127, Siddhesh Lad 108, DA Jadeja 3/95, Unadkat 4/71, Sakariya 3/86) and 175 for 5 in 32 overs (Iyer 83, Dube 39, Unadkat 2/26, Sakariya 2/38) lead Saurashtra 348 in 119.3 overs (Chirag Jani 85, Sheldon Jackson 95, Mankad 59, Roston Dias 2/63, Shivam Dubey 2/34) by 221 runs. It was a great batting display by Karnataka who made the batting look easy and declared their second innings at 290 for 2. Set the target of 362 runs to win, Railways ended day 3 at 44 for 1. Railways require 318 runs to win. The defending champions Vidarbha are 9 wickets away from a win against Gujarat. Starting the third day at 238 for 3, Vidarbha were bowled out for 485. In their second innings, Gujarat ended the day at 22 for 1. Gujarat 321 in 108.5 overs (Dhruv Raval 79, KP Patel 55, Kathan D Patel 105, Sarwate 4/71) and 22 for 1 in 10 overs (Kathan D Patel 17*, Karnewar 1/6) trail Vidarbha 485 in 145.5 overs (Wasim Jaffer 126, Wadkar 88, Ganesh Satish 75, Desai 8/148) by 142 runs. It was another good performance by Chhattisgarh batsmen as they posted a massive total of 462 runs in the first innings. In their second innings, Maharashtra ended the day at 172 for 3. Maharashtra 239 in 68.3 overs (Rahul Tripathi 102, Sanklecha 66, Vishal Singh 4/59, Pankaj Kumar Rao 3/32) and 172 for 3 in 44 overs (Kedar Jadhav 103*, Omkar Verma 3/53) trail Chhattisgarh 462 in 140.5 overs (AJ Mandal 135, AN Khare 108, Ashutosh Singh 114, Harpreet Singh 22, Sanklecha 5/89, Fallah 2/69) by 51 runs. Andhra have taken a first-innings lead over Bengal. Andhra Pradesh began the day at 108 for 2 and with contributions from every batsman, ended the day at 321 for 9. Andhra Pradesh 321 for 9 in 119 overs (Gnaneshwar 66, KS Bharat 61, Mukesh Kumar 3/45, Pramanik 3/69) lead Bengal 300 in 110.3 overs (Manoj Tiwary 90, WB Chatterjee 76, Pramanik 43, AS Pan 39, Sasikanth 5/55, Prithvi Raj 3/81) by 21 runs. Delhi defeated Madhya Pradesh by 9 wickets to register their first win of the tournament. Starting the third day at 7 for 0, Madhya Pradesh were bowled out for 157. Delhi chased down the target of 29 runs with ease. Delhi 6, Madhya Pradesh 0. Himachal Pradesh made good progress on day 3. Resuming from the overnight score of 340 for 5, Himachal Pradesh were bowled out for 463. At the end of day's play, Tamil Nadu were placed at 178 for 2. Tamil Nadu 227 in 78.4 overs (Baba Aparajith 53, AB Tanwar 44, PP Jaiswal 3/45) and 178 for 2 in 57 overs (Mukund 111*, Jaiswal 1/20) trail Himachal Pradesh 463 in 116.2 overs (Kalsi 144*, Rishi Dhawan 75, Gurvinder Singh 8, M Mohammed 2/67, T Natarajan 5/122) by 58 runs. Starting the third day at 202 for 4, Punjab were bowled out for 303. Ravi Teja picked 5 wickets while Mohammed Siraj took 3 wickets. In their second innings, Hyderabad ended the day at 155 for 2. Hyderabad 317 in 109.3 overs (Akshath Reddy 77, Tanmay Agarwal 60, Himalay Agarwal 79, Mayank Markande 6/84, S Kaul 2/80) and 155 for 2 in 55 overs (Akshath Reddy 67*, Tanmay Agarwal 54, Mayank Markande 1/35) lead Punjab 303 in 93.5 overs (Gurkeerat Singh Mann 87*, Anmolpreet Singh 85, Mandeep Singh 63, Ravi Teja 5/57 Mohammed Siraj 3/74) by 169 runs. Starting the third day at 119 for 4, Assam were bowled out for 235 in their second innings. Chasing the target of 218 runs to win, Goa were reduced to 78 for 6 before an undefeated 88 runs partnership between Lakshya Garg and Amit Verma helped Goa end the day at 166 for 6. Goa require 52 runs to win. Thanks to unbeaten 125 not out by Jammu and Kashmir captain Parvez Rasool, Jammu and Kashmir ended the third day at 272 for 7. Jammu and Kashmir 127 in 53.3 overs (OA Shah 44, A Choudhary 27, S Pradhan 4/27, B Mohanty 3/24) and 272 for 7 in 102 overs (Parvez Rasool 125*, Qamran Iqbal 67, Basant Mohanty 2/45) lead Odisha 323 in 106.3 overs (AS Raut 116, Anurag Sarangi 57*, Samantray 85, Irfan Pathan 4/52, Umar Nazir 3/49) by 76 runs. It was an exciting day of cricket between Jharkhand and Services. Starting the day at 49 for 1, Jharkhand were all out for 343. Jharkhand have set Services the target of 270 runs on the final day. Jharkhand 193 in 66 overs (Ishan Kishan 68, Kumar Deobrat 48, Arun Bamal 4/37) and 343 in 97.2 overs (Ishan Kishan 68, Siddiqui 34, Arun Bamal 4/37, Pathaina 2/34, Pandey 1/41) Services 267 in 93.3 overs (Paliwal 79, Ravi Chauhan 69, Bamal 46, NH Verma 16, Anukul Roy 4/66, S Nadeem 3/29, Varun Aaron 1/17). Services need 270 runs to win. Haryana 118 in 36.2 overs (Harshal Patel 53*, Aniket Chaudhary 5/45, KK Ahmed 3/33) and 244 for 3 in 71 overs (Bishnoi 87*, Rana 83) trail Rajasthan 490 for 6 d in 158 overs (Robin Bist 150*, Lomror 106, Bist 61, Yuzvendra Chahal 3/107, HV Patel 1/86) by 128 runs. 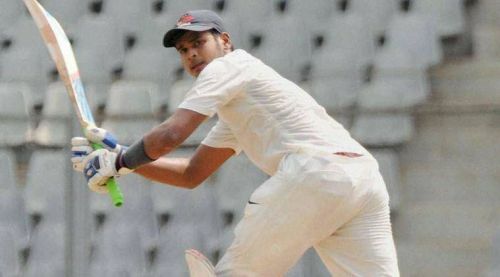 Uttar Pradesh defeated Tripura by an innings and 384 runs on the third day. Tripura started the day at 33 for 4 and were bowled out for 108 in their first innings. After having been asked to follow on, they were dismissed again for a paltry total of 60. Uttar Pradesh 552 for 7 in 149 overs (Priyam Garg 206, Rinku Singh 149, Akasdeep Nath 106, Rana Dutta 2/79, SS Das 4/164) beat Tripura 108 in 44 overs (SK Patel 47, Pratyush Singh 10, Zeeshan Ansari 3/33, Ankit Rajpoot 2/42) and 60 in 25 overs (Rana Dutta 22*, Ankit Rajpoot 6/25) by an innings and 384 runs. Uttar Pradesh 7, Tripura 0. It was an amazing performance by Bihar batsmen to declare their innings at 504 for 8. Starting the third day at 255 for 3, Bihar declared their second innings at 504 for 8. Chasing a massive target of 446 runs to win, Nagaland ended the day at 112 for 7. Nagaland require 334 runs to win. The third day’s play saw Puducherry win the toss and opting to field first. Due to bad pitch conditions only 8.2 overs were possible.